Microsoft has named Satya Nadella as its new CEO and announced that founder Bill Gates will step down as chairman of the company's board. Nadella is a 22-year veteran of Microsoft (MSFT) who has been overseeing various aspects of the company's corporate software business since 1992. Over the past several years, Nadella's cloud and enterprise division has been one of Microsoft's best-performing units. As Microsoft's cloud and enterprise group chief, Nadella oversees the company's server software and back-end technology for corporate customers. He also is in charge of several consumer cloud products, including Office 365, as well as the Bing search engine, Xbox Live and Skype. Prior to joining Microsoft, Nadella worked at Sun Microsystems, which is now owned by Oracle (ORCL). Nadella has been named CEO amid a major transition at Microsoft. He is replacing Steve Ballmer, who announced in August that he was stepping down as CEO. The company's famed consumer business is struggling, including sales of Windows. Meanwhile, corporate revenue now makes up two-thirds of Microsoft's overall sales and is instrumental in driving Microsoft's growth. "During this time of transformation, there is no better person to lead Microsoft than Satya Nadella," said Gates in a prepared statement. "His vision for how technology will be used and experienced around the world is exactly what Microsoft needs as the company enters its next chapter of expanded product innovation and growth." Microsoft also said that Gates will be working closely with Nadella in a new technology adviser role. Gates will be replaced by current Microsoft board member and former Symantec (SYMC) CEO John Thompson as new chairman of Microsoft. Gates and Ballmer will remain on the company's board. Nadella was Microsoft's second-highest paid executive last year, earning $7.7 million in salary, bonuses and stock grants. Only chief operating officer Kevin Turner made more. Microsoft has not yet announced Nadella's new compensation package. 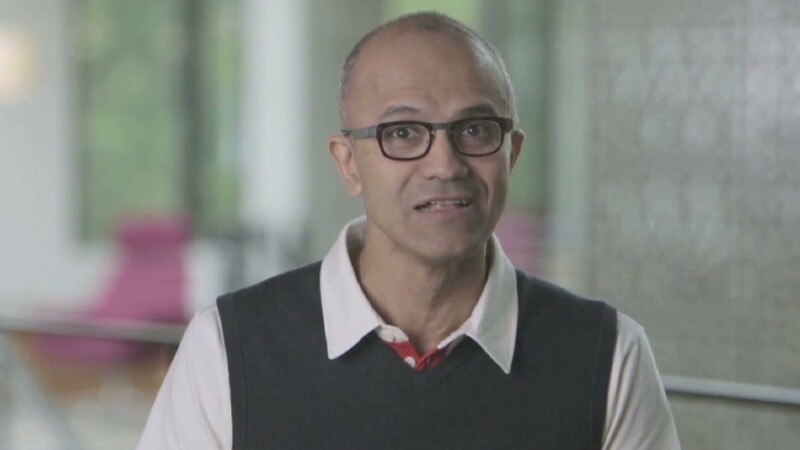 Many think that Nadella is somewhat of a safe choice for Microsoft. He is personable, and well-liked at Microsoft and within the technology world at large. But he isn't bringing fresh perspective or any outside influence. In many ways, Microsoft's CEO search was bungled from the start. Ballmer failed to groom an obvious replacement during his 13-year tenure as CEO, and he announced his retirement with no successor in place. The CEO search was filled with leaks to the press, particularly about the desire to hire Ford (F) CEO Alan Mulally. But the board was seemingly unable to find an outside candidate they could agree upon. The choice of Nadella seems to be a signal that Microsoft wants to maintain the status quo even though it is a company that many believe needs shaking up. Nadella acknowledged that a main part of his job as CEO will be to speed up the process of bringing innovative products to customers. Microsoft has struggled to adapt to the mobile revolution, as Apple (AAPL) and Google (GOOG) have dominated that market. One of his key tasks will be to find a way to integrate the mobile device business of Nokia (NOK), which Microsoft agreed to buy last year. "I couldn't be more honored to have been chosen to lead the company," Nadella said in a statement. "The opportunity ahead for Microsoft is vast, but to seize it, we must focus clearly, move faster and continue to transform." It's unclear how much leeway he will have though. Even though Gates will no longer be the company's chairman, the Microsoft founder is taking a more active role at Microsoft, which could mean his grip on the company is only getting tighter. "There is no question that this is still Bill's company," said a Microsoft employee who asked not to be named. But analysts are hoping for more drastic moves. One worried that Nadella will face resistance from Gates and Ballmer. "We do not want to see a continuation of the existing direction for the business, so it will be important that Mr. Nadella be free to make changes," said Rick Sherlund, analyst at Nomura Securities. "We question whether it will become necessary for Mr. Ballmer to step aside as a director to facilitate this. We do not think having two previous CEOs on the board to report to as he redirects the business is a good idea."